the right light every time. smart phone, or other personal mobile device. LED lighting technology is used for this novelty bedlight, so as to provide soft warm yellow or natural white daylight as well as a higher level of brightness. provide soft or extra bright ness as you want. This creative LED electric desk lantern has a elegant long and tall goose neck flexible sleek arm which is capable of providing eye caring lighting at many different angles. pretty girls makeup, traval, relaxing, painting, read books and writing at home, kitchen, household, bedroom, office, school, college library, dorm, living room. fine ornament for your tabletop of reading room, nightstand of bedrooms, etc. 1 ) NO NEED TO FIND CHARGING SOCKET - At the back of base, this desk lamp is equipped with 5 V / 1 A output USB charging port for your convenience to charge some USB powered items like phones or other electronics at any time without finding another charging socket at other places which are not close at your hands. 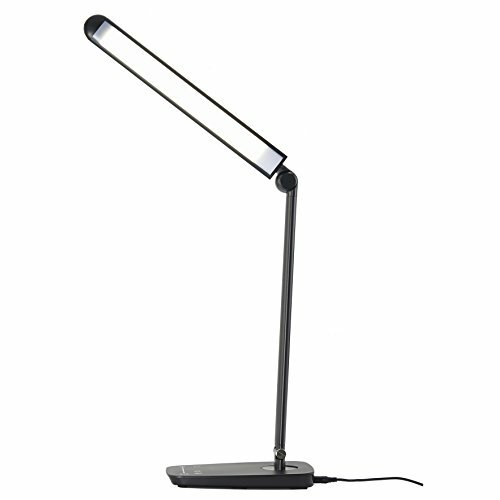 2 ) REDUCE EYE STRAIN & FATIGUE - Non flicker lighting technologies used in this lamp reduce the pupil contraction frequency protect when you are reading studying or working, so even you have already been under this lamp for a long time, your eyes can not feel any eye strains or eye-fatigue. A great lamp for kids or students. 3 ) BRIGHT ENOUGH TO LIGHT UP YOU - With 108 pc of LED chips(max. to 12 W) provide a wide range of soft and bright light for you to read book or work beside the computer, 7 light mode controlled by touch sensor panel, memory. recall, the lamp will always remember your preference of light modes. 4 ) ROTATION FREE BED LAMP - The main arm can swivel at the base, the head can move up and down to adjust it to the perfect angle that makes you feel comfortable. 5 ) FREE EXCHANGE - Aviation aluminum alloy material metal desk lamp with AC adapter with UL certification, durable and safe, easy-to-read manual, and 1 year FREE exchange for a risk-free purchase. If you have any questions about this product by Lichamp, contact us by completing and submitting the form below. If you are looking for a specif part number, please include it with your message.